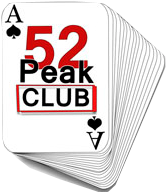 Use this site to track the cards that you've earned as a 52-Peak-Club member. Log in using your Meetup identity. Use this site to update the cards the members have earned on hikes that you have led.